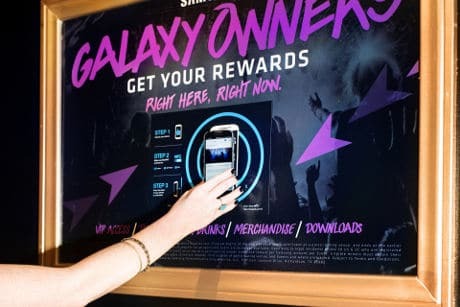 Samsung is providing Galaxy NFC device owners with a range of exclusive rewards and incentives via a new service that offers access to VIP lounges and suites, seat upgrades and vouchers for concessions and merchandise at 41 AEG venues across the US. To participate, Galaxy S5, S4, S III, Note 3 and Note II device owners download the Samsung Owner’s Hub app from Google Play and tap their phone to NFC posters in the venues to unlock rewards. Free music downloads and access to Samsung’s new Milk Music streaming service are also available via the NFC posters.